GBA Dragon Ball Z: The Legacy of Goku (USA) in 13:46.29 by MUGG. 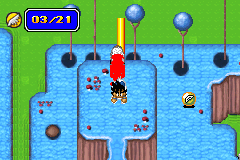 Dragon Ball Z: The Legacy of Goku is an action RPG based on Dragon Ball Z, developed by Webfoot Technologies. It is the first game in The Legacy of Goku trilogy. Together, all three games tell the original story of Dragon Ball Z, more or less. This run by MUGG uses copious amounts of luck manipulation and flight retention to beat this rather grindy game in a little under 14 minutes.